Every evil wizard occasional faces the threat of treasure hunters, do-gooders, and other barbarians. In order to exterminate such vermin, you must learn to defend yourself from their attacks. Alarm is a first-level spell that lasts 8 hours. If you want to raise your minions, set an audible alarm. If you want to prepare your own welcome for the accursed intruders who dare to challenge you, set an inaudible alarm. Either way, you should ever face an attack unprepared. Wizards will always have mage armor and other defenses that do not require concentration cast. They will probably have one active spell that requires concentration. When some group of meddling simpletons dares to attack, always find a ready source of cover. In fifth edition, a character can move out of cover, cast a spell, and then duck back into cover. No PC should ever gain an attack on a spellcaster unless they either readied the attack or met the caster in melee. Without cover, a fifth-edition spellcaster will die halfway through the first round, a victim of either DM carelessness or the adventure designer’s. Many wizards seek brutish bodyguards, but your best protection comes from apprentice wizards. Students can lend their concentration to shield you in additional defenses or to lock down the battlefield. Best of all, they can do all that while remaining behind cover, out of view. Apprentices can make players rethink the virtue of an all-out attack on an obvious leader, and such decisions make a better fight. The best encounters probably come when players face a leader protected by a mix of apprentices and brutes. Your essential defensive spells either last without concentration or work as a reaction. Starting at level 1, every wizard should prepare Shield and have Mage Armor cast. Even compared to higher-level options, Mirror Image ranks as the best no-concentration defensive spell. The blink spell allows you to vanish from the battlefield in between half of your turns. The blinks force attackers to switch targets or to ready attacks for the blinker’s reappearance. When you blink, use your 10 feet of Ethereal movement to thwart readied melee attacks. You shroud yourself in flames that offer resistance to heat or cold, and that punish melee attackers who hit. As a 4th-level spell, Fire Shield ranks as the worst no-concentration defense. The damage amounts to less than a typical melee attacker can deal, and wizards lack health to lose in trade. Still, you never face more than one group of foolish meddlers per day, so you can spare the spell slot. In first-edition AD&D, Fire Shield returned twice as much damage as an attack dealt the wizard. Second edition dropped the punishment to match the damage dealt. Third edition dropped to 1d6+caster level. 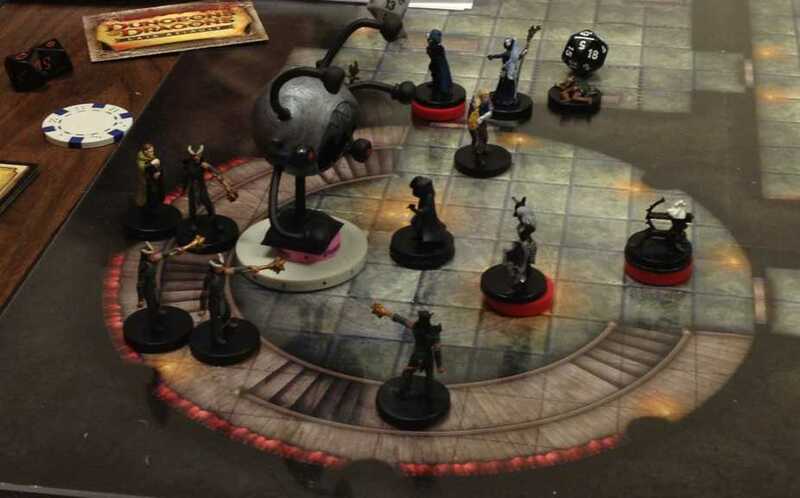 Fifth edition sinks to 2d8 damage, less than most monsters challenging a 7+ level wizard. I assume designers kept shrinking the damage to keep mages vulnerable to melee. With the concentration rule making wizards more vulnerable than ever, Fire Shield should dish more damage. This is a level-2 spell lost in a level-4 slot. As a wizard facing a party of murderous treasure hunters, you have plenty of spells, but few actions to cast. Counterspell lets you trade another caster’s action for a reaction that you probably would not use. Counterspell helps balance the odds for outnumbered casters, but the spell can take fun from D&D combats. When foes counter spells, players see their turns nullified. When foes get countered, fights turn into batting practice. If your enemies waste time chasing your enforcers while you pose as a footman or food taster, you gain the upper hand. If you pose as a jester, the simple fools could even mistake your gestures and incantations for mummery. Don’t allow villains to use this ruse often, because the game suffers when players learn to suspect every bystander is a villain or traitor. You turn invisible and leave an image of yourself in your place. Mislead is perfect for when you want to bargain or explain how your ingenious plan will destroy all who oppose you. Your invisibility ends if you cast a spell, but you might maintain the ruse by stepping out of view and casting spells without an obvious point of origin. Among other things, Magic Jar lets you possess some other humanoid and use it as a puppet. Either give your enemies a nasty surprise after they “win,” or possess nobles with their own guards and protectors. Magic Jar brings enough narrative weight to become a central element of an adventure. For a good look at the spell’s inspiration, see “Spells Through The Ages – Magic Jar” at Delta’s D&D Hotspot. Do you like long monologues and frustrated enemies? You’ll love this spell. This upgraded version of Mislead lets you create your image in a familiar location up to 500 miles away. You still cannot cast spells from the illusion, but if you surround it with enough henchmen, then they crush your foes while you sit in comfort. Project Image teases players and builds loathing for the villain. In addition to using levitate to rise out of reach of attackers, you can levitate unwilling foes. Also, decorate your ceiling with spikes. If you DM long enough, you will accidentally pit flying PCs against earth-bound monsters, and then watch helpless monsters die to less-than-heroic bombing attacks. Fly and Levitate can make good defenses that prevent PCs from swarming. Just do not create a encounter where the wizard can remain untouchable and out of range. Defensive spells that require concentration offer much less protection than in days past. Even the Globe of Invulnerability pops like a balloon when a single arrow breaks concentration. Some Invulnerability. Foes who rely on concentration defenses should also have the War Caster feat. Advantage on concentration checks goes a long way to keeping defenses in place. By imposing disadvantage on attackers, Blur offers a solid, low-level defense. As soon as your foes discover your resistance, they’ll switch attacks. Concentrate on Haste instead. This spell works better for player characters who, say, plan to attack a fire cult and expect to spend an hour battling foes wielding fire. Duration aside, Haste protects much better than Protection from Energy. You gain advantage on Dexterity Saves, +2 AC, plus the extra speed and action. Under Greater Invisibility, you can blast accursed do-gooders while their attacks suffer disadvantage. To evade area attacks, use Misty Step and keep the dolts guessing your location. Misty Step just takes a bonus action to cast, but you cannot cast a spell as a bonus action and cast another spell other than a cantrip in the same turn. See Player’s Handbook page 202. Only this rule keeps Misty Step from rating as my favorite spell. The quality of Stoneskin depends on the number of attackers wielding magical weapons. Against many groups, it offers nothing. The so-called Globe of Invulnerability only protects from magical attacks. Combine the globe with some no-concentration defenses, the War Caster feat, and an inaccessible perch, and it starts to live up to its name. This edition lets Globe of Invulnerability block 5th level spells as well as spells of up to 4th level as in earlier editions. That fails to make up for the concentration requirement. Grease gives apprentice casters a way to slow attackers. For fun, ready Cloud of Daggers. When attackers open your door, target the threshold. Darkness makes everyone in its area effectively blind and invisible—a handicap to ranged and melee attackers, but little problem when you blast with area-effect spells. Darkvision does not let you see through magical darkness. This spell can choke avenues of attack. Also, once cast, the Flaming Sphere gives a you way to attack as a bonus action while remaining invisible or disguised. The foolish air cultists of the Howling Hatred showed the weakness of Gust of Wind. Still, it can slow a rush. Too bad it doesn’t interfere with ranged weapons as Wind Wall does. Once, you could cast Silence directly on spellcasters and prevent them from casting any verbal spells for the duration. Now, you must target a point in space, so casters can move out of the effect. This spell still makes spellcasters uncomfortable, especially once your lackeys engage them in melee. For slowing attackers, Sleet Storm a good value for the slot. Heavy obscurement blinds and hinders ranged attacks, while the slippery, difficult terrain slows a rush to attack. You hardly need to conceal your pit traps at all. Wall of Fire may do a bit less immediate damage than Lightning and Fireball, but it lasts, forcing your foes to move and take more damage, or stand still and take more damage. That never stops being funny. The level 5 and 6 walls tend to prevent any attacks across the wall, so they work best with a divide-and-conquer tactic. Let the knuckle-dragging fighters rush to attack, then drop the wall to separate those clods from their allies. For maximum evil, combine with Eyebite. The spell description says that “nothing can physically pass through the Wall of Force.” Physically? D&D top-banana Mike Mearls says spells cannot pass a Wall of Force, which matches their behavior in earlier editions. Also in earlier editions, teleport, dimension door, and gaze attacks could pass. Wall of Force often features in player schemes to automatically win every encounter by using the wall to trap monsters in a sort of killing jar. Years ago, a player told me of combining the wall with Create Water to drown monsters. Third edition stopped such shenanigans by requiring that the wall manifest on a single plane. Now, players combine walls of fire and force to trap and incinerate every monster, forcing their DM to seek help. So in a misstep, this new edition reopens the door to old DM headaches. Alas, you cannot create a Wall of Stone in the air where it will fall and crush the fools who oppose you. Wall of Stone becomes permanent after 10 minutes, so it serves both tricky players who want to seal parts of the dungeon and fantasy economists who want to put imaginary masons out of work. Wall of Ice combines some of the damage dealing of Wall of Fire with a superior barrier. Sometimes your enemies get lucky and force a temporary retreat. Later, you can return to crush them like insects. This spell grants the speed to outrun everyone except monks and rogues. If they dare to chase you, then make them die alone. Don’t bother preparing Invisibility unless you either plan to cast it on your assassins or plan to use it as an escape. The invisibility ends when you cast a spell, and it demands concentration, so it just takes you out of the fight. To escape, use Misty Step to teleport to someplace relatively inaccessible, such as a balcony or across a chasm. Remember that characters must take bonus actions on their turns, so they cannot wink out at any moment. Gaseous Form is only useful if you can immediately pass through a crack or keyhole. Teleport and Dimension Door allow near certain escape. Just allow time to cast them before a lucky blow can bring you down. Next: A line of defense so potent that it deserves a post of its own: the Glyph of Warding. This entry was posted in Advice, D&D fifth edition and tagged Mike Mearls, spells, tactics, wall, wizard. Bookmark the permalink. David, I really appreciated the tactics called out in this post, but loved the tone even more. Treating an evil spellcaster as a simple statblock for our players to blow by does a disservice to the tradition, and potential, of the game. Taking the time to view a party of adventurers the way an evil mastermind would forces us to muster a lot more cleverness and creativity to “defense.” Bad guys plan ahead too – thanks for reminding us of what it takes to win! Thanks for the good word. I glad you liked the tone. A few of my evil remarks made me cackle to myself, but I didn’t know if the viewpoint would work for anyone else. What a great article. I’m already in fear if my DM brother gets ahold of it. Naturally, I’ll use it first. Kudos. Very cool writeup. Agree with the previous comments!